When I look through the previous years of journaling my life, April is notoriously empty. I looked at the calendar and couldn’t believe that we have been home almost an entire month and I haven’t written a single word about ‘life’. Thinking I could do a bit of comparison, I traveled back through the blog and found that almost every single year since I started blogging has just two posts or even less during the month of April. One is usually about Easter, and the other one is about gardening. In fact, I could almost post last years blog from April and it would fit this year without a hitch. I can remember times in my life when everything shifted at such a pace that there would most certainly be huge differences from year to year, even from month to month. I have to say how grateful I am for a life that is just a bit more predictable, a bit more calm, a life where April means gardening, cleaning up the pine needles, and decorating for Easter. If I had lived a safe, predictable life for the last 69 years, it might be different. I could be hankering for change, for adventure, for variety. I have been blessed with more than enough adventure, more than enough variety, with parts of my life so long gone and so unrelated to this current existence that I barely recognize myself in those old stories. Instead, I am celebrating sameness, celebrating the repeat of the seasons, celebrating watching planted trees mature and gardens fill in over the years. You might have had to have lived a mixed up life like mine once was to really ‘get’ this. I now have adventure and unpredictability in small manageable doses, enough to keep me energized, but not enough to make me crazy. In between all the yard work, I have been quilting. When my sweet little Bernina 1230 needed some serious repairs (she is after all more than 30 years old), I succumbed to the siren call of a new sewing machine, the Bernina 550 Quilters Edition, outfitted with a special stitch regulator for free motion machine quilting, and a superb walking foot for getting through all those thicknesses of fabric and batting. Mornings are cool enough that I can spend them at the machine working on a springtime quilt I started a year ago before going outdoors as the days warm up for afternoon work. We took a few days early in the month to work at the Cottage, with a chance to mow and rake and share meals with Deborah. While Mo and I were gallivanting around the country this winter, Deb was busy painting the cottage interior, making things look so much cleaner and brighter. Mo and I loaded up the tractor to take over the hill so we could do some dirt moving and tear down an old building or two. The burning season will be short this year, with the serious drought, so we needed to do this job as soon as we could manage it. More to come, but it is nice to see the place looking cleaner outside as well as inside. Daughter Deanna and her husband Keith managed an I-5 run through Medford, and we celebrated with a spontaneous morning breakfast. I can’t believe just how quickly those two move back and forth across the country. Just two days prior to our breakfast, she and Keith were having breakfast with son John and his dad back in Missouri. Deanna and Keith are dealing with new rules for California emissions that have created epic troubles for their truck and for them. They haul to Canada and Alaska, haul all over the country, have to have a heating system that will work in sub zero temperatures, but the new law requires some sort of emission thingy that is giving them tens of thousands of dollars worth of headaches. Deanna is needles to say, furious. Once again they are back at their home base in Washington, waiting for Cummins to get the dang thing fixed. It is amazing to me that after three months on the road, with almost daily writing, that I have no desire whatsoever to track my life with a journal. Or maybe not so amazing. After sewing all morning and gardening all afternoon, I fall into bed much too early, attempt to read some blogs or a book and am usually asleep within minutes. Now and then I attempt to make a comment or two with the ipad fingers, but that usually results in some stupid sort of typo that I can’t undo, so I just give up. To all those loyal readers out there, who followed along on our travels, I am glad you have so many other places to go for entertainment. To all those bloggers who may or may not have noticed my comments, sorry. I am trying to read, but commenting isn’t coming very easily these days. I decorated the house for Easter almost immediately after taking down the Christmas tree in early April. That felt just plain crazy, actually, and I hope I don’t have to do that again. If we travel quickly after Christmas in the future, I will make an extra effort to get the Christmas decor put away before we leave! It has been nice this year to have Easter late in the month, and for us it will be even later. Due to some family commitments, we are having our traditional Rocky Point Easter celebration next Sunday. The weather has been gorgeous for the entire month, with moderate daily temperatures and nights barely near freezing. The sun has been invigorating, an unusual thing for April in this part of the world. There have been times when we are still looking at snow on the ground in April. It is beautiful, but does engender a bit of concern for the coming summer season. The predictions for mixed snow and rain next weekend will be a bit of a damper for our Easter celebration, but are definitely a good thing for the water situation here in the Basin. Another little extra time user in my life has been the addition of the Adobe Lightroom software. I started shooting RAW format photos while traveling, but didn’t have the time or the computer hardware to handle them well. Once home, I installed Lightroom, and with encouragement from both Erin and my daughter Deanna, I have learned to import, develop, and manage the huge RAW files into something useable. Of course, with all those old files from the trip, including several hundred from Antelope Canyon, I haven’t picked up the camera once this month to shoot anything new. The few photos on this blog were actually shot with my iPad. In addition to taking a break from journaling and reading, it seems I also have taken a break from carrying the camera around! This time last year I was still working part time, and as most full time retirees say, how in the world did I have time to work? Hopefully after next Sunday I will manage at least one more post for the month of April with photos of our belated Easter celebration. We are home, and “home run” can mean more than one thing. First, the trip was a classical “Home Run”, meaning a great success. Secondly, we “ran home” pretty darn fast once we were heading that way. The weather was spring-like throughout the west, completely unpredictable. I have been trying to keep up with fellow bloggers, many of them Canadians, who are also on the trek home. Many of them are meandering, with a month or so to get north. Others are bookin’! I especially loved reading about Peter and Beatrix’s homecoming. Sheesh. Made me really appreciate coming home to Rocky Point with just gray skies, a skiff of snow here and there, but nothing to speak of on the ground. Lucky us. With high winds predicted all along our route from Edward’s AFB north, along highway 395, we hunkered down for a day, waiting for a break. The morning we left, things were reasonably quiet, and we traveled north towards the back side of the Sierras without any difficulty. We had seen several reader boards touting high wind advisories, and when I had access to the internet, I saw chain requirements on several stretches of 395. Somehow we missed all the bad stuff, both before us near Mammoth when we got through without chains which were required later that night, and the next day when we waited long enough for the chain requirements to be lifted north of Susanville. In spite of all the dire warnings, the trip home was a piece of cake! Sometimes our luck is so incredible I have to trust that it is someone watching over us more than mere luck. We drove 350 miles or so the first day before spending the night at Silver City RV Resort in Minden, and completed the second leg of our route home with ease the next day. For me, coming home was a bit strange. I felt completely loose, ungrounded, disconnected and weird. I suppose that is to be expected after more than 3 months away, but it didn’t seem to bother Mo in the least. We were both really happy to be home, but I was rather disoriented. Today I am fine. It took a day or so, and a hug from my daughter and granddaughter for me to come down to earth, but now everything feels normal again. Recapping the trip, going over the numbers, helps me to put it in better perspective. We traveled 9,179 miles/14,772 km in the MoHo, with an additional 2,500 miles of explorations in the Tracker. Our total fuel cost was $4,179.55 an average of 46 cents per mile. Fuel for regular gas ran the gamut from 2.99 at the lowest in New Mexico and 4.99 the highest on the California border. We camped 84 nights (not counting our 8 days on a cruise ship) with an average cost per night of $17.39. 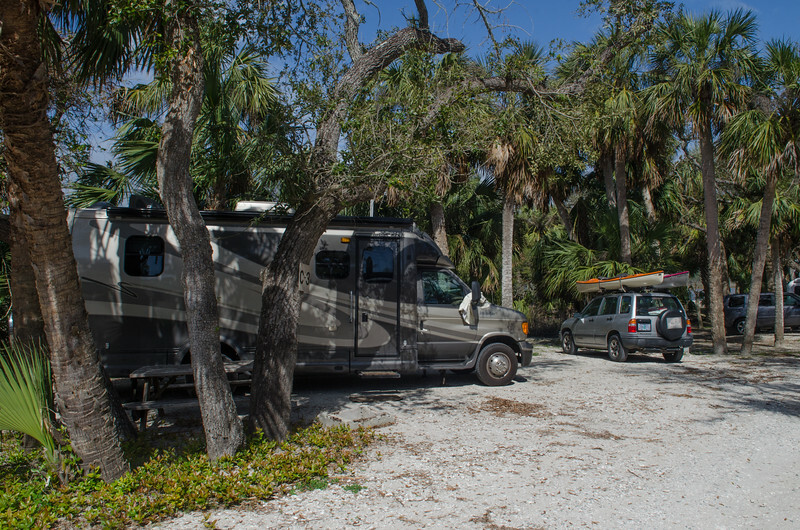 Our expensive campgrounds in Florida were offset by several nights boondocking and discounted National and Passport America parks. Now it is time for doing taxes, starting on the winter yard cleanup, putting away the Christmas tree decorations, and getting ready for Easter with the family here at home. Today I’ll fill the bird feeders for the birds that are returning. The hot tub water is balancing nicely and tonight will be our fist soak under the stars in a long time. I have some amazing memories of the trip, images in my mind that stick and come to me when I am still. I also have an untold number of images on the computer to go back to when I want to remember our travels. There are a few days and some great experiences that I didn’t manage to write about during the trip, and those stories are waiting in the wings, but they will be backdated as catch-up posts. Any fears we had about being gone for three months never materialized, but it was a long time to be away from home. I am not sure we will do that again. A month or two at a time might be enough for us in the future. For me, the most noticeable feature about traveling for that length of time is the ability to live in the moment, not worrying much about anything except where the next stop might be, or the next hike. Life does require a bit more than that when back in the “real world”. Unlike full timers, we didn’t take much of our “real world” with us, leaving those concerns back home and putting most everything on hold. Sure, we had the internet, and Quicken, and a printer when we needed it. We had telephones for communication, and yet when I talked to my closest friend Maryruth in California a couple of days ago, she exclaimed, “I am so glad you are home! I missed you!”. We both laughed about how different it felt to talk on the phone from home than it did from our “vacation” home. Just different somehow. My daughter said the same thing yesterday when we had lunch together in Klamath Falls. I can’t explain it, but I am glad I am home, really home.